Place farro in a medium pot and add 6 cups of water and ½ teaspoon salt. Cover, bring to a boil, then turn heat down to low and simmer for 50 minutes. While farro is cooking, cut the cobs off the corn. Add the corn cobs to the cooking faro and let them simmer along. 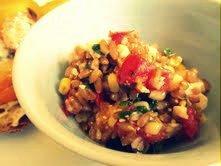 Add corn kernels to the farro during the last 5 minutes of cooking. Place the pressed garlic in a large bowl. Zest the lemon into the bowl with the garlic. Cut the lemon and squeeze its juice into a separate small bowl. Measure 2 teaspoons lemon juice into the bowl with the garlic (refrigerate any additional lemon juice for another use). Add the olive oil, herbs, and ¾ teaspoon salt to the bowl and whisk to combine. If you don’t have marjoram, use any fresh tender herb (parsley, basil, cilantro, or mint in any combination would be fantastic too). Add the diced tomato and any juices that have escaped to the bowl with the dressing, and let it marinate while the farro finishes cooking. Drain the farro and corn over a bowl (save the liquid for soup broth), then add faro & corn to the bowl of dressing and toss to combine. Wait about 5 minutes for the salad to cool a bit, then stir in the feta. Add salt and pepper to taste.